Is Poor Timing Killing Your Dental Business? Most dentists know sweet not much about timing. Very few know how to run efficiently to time. They either run late, and abuse other people’s time, or they waste time, and abuse their own time. And it’s not a fine line. It’s two sides of a fence. And nobody likes to feel rushed, either. It’s just downright rude to run late and keep people waiting. Yet some dentists never run to time. And that pretty well sums it up. Yet I still see, and hear of dentists who are late back from lunch, who are late into work, who are always running behind. And then…there are those who don’t know how to present their time. They allow too much time for things. So that they waste time, in sections, all throughout the day. Mainly they’re wasting their own time. But it’s a waste of their own potential. Because once time is gone, it’s gone forever. To do the best we can in business we need to manage time better. We need to strive for perfection when it comes to time. Last Sunday night in Brisbane, my wife and I dined out. On this occasion, our time was very poorly managed. To the detriment of the restaurant. Our order for dinner was simple. A pre-dinner drink. An entrée [starter course]. A main meal. And a glass of red wine to follow the pre-dinner drink. Followed very closely by the entrée [starters]. So closely, that only a sip of the pre-dinner drink was in fact, pre-dinner. The rest of the pre-dinner drink was a with-dinner drink. And no sign of the red wine. Once the starter course was consumed, there was still no sign of the red wine. The main meal servings arrived next. So quickly, that the whole meal was served and eaten in about forty to fifty minutes of our arrival. And we probably took ten to fifteen minutes to be seated, to get comfortable, and to review menus before placing our orders. Now I must point out that the food was superb. It was fresh, it was al dente. It just simply was not well spaced and planned out. And when it feels this rushed, you feel almost violated…. How are things at your practice? Are things being rushed and hurried? When sometimes there’s no need for it to be that way? Are things rushed and hurried when indeed, there is no need for urgency at all? Is the rushing and the hurrying of some, at you Dental Office, detracting from the efforts and contributions of others? At the restaurant, the spacing of the meals, the timing, the intervals at which they arrived, completely detracted from the quality of the cooking and the service skills of our wait staff. Is it the same at your Office? Are some people’s paces and speeds, when dealing with patients, detracting from the great work of others who are creating a “relationship” with our clients? Are your Dental Assistants rushing your patients so that all they remember is the rush to get in and out of the treatment room, and not the “feeling” of relaxed that they felt in your client lounge, prior to their treatment? Or is your doctor machine-gunning out his treatment plans and protocols in such a rapid-fire way that your check out concierge is being forgotten for all of her compassions and her courtesies? Take a good look around at your total processes at your practice. Is there congruence across your office, so that your customer experiences a total experience? Or is it simply a collection of individual cells, or stages? Because your patients will notice the incongruence…. Have You Really Got The Best Team Possible? I’ve been on a number of committees in my time. And committees are just like teams. Except they’re very often unpaid. For a good committee to function well, every member must know their role and know what they have to do. Not just for themselves to do. But also what to do for each other. And it’s the same in a Dental Office. A good committee, or dare I say it, a committee of good members, is only as strong as the weakest member allows the committee to be, through their actions, and their inactions. And it is the same in a Dental Office. Frustrations can occur when good team members and great team members are restrained and curtailed by the inadequacies of other members of the Dental team. Good effective committees also need good leadership. And so do good Dental teams. Ineffectual leadership, and wishy-washy direction from the top can hamper the productive juices of those who just want to get on with what they need to do, for the betterment of the practice, or the business. Which of course is for the betterment of the valued clientele, and patients. And is ultimately, for the betterment, of the team. I’ve been serving as secretary of a local sporting group. And I know that the role of the secretary is a thankless task. Well my role, in disseminating information to the members of the body has been hindered considerably by a captain who has failed to follow protocol and pass on necessary event results. And because of this the membership suffers. Do the members suffer because the captain failed his duty? Or do the members suffer because the secretary failed to do the nurse-maiding? Either way, the committee has let the membership down. Is there a “gunner” leading your business? “Gunner do this. Gunner do that”? But never gets around to doing anything, much. To the frustrations of those on the team begging for direction and leadership. Or is your captain a great director, and leader, but your team has members who are not as effective as they should be? Does your team have too many reactive members and insufficient proactive members? Your team needs the right balance. And the correct balance depends upon the desired results you want for your business. There’s no point building a team and seeing what they can achieve. That’s getting the cart before the horse. You need to know what you want the team to achieve, and then find the right members, with the right behaviours to achieve that desired result. These will be my final workshops in Australia for 2015. I love to fine dine. So that when I do, it’s special. The thing about fine dining for me is it’s not about the food. Sure, the food has to be good. But the best thing about fine dining, I find, is the experience. My wife and I celebrate our birthdays, and our anniversary, by fine dining at lunch. And by good fortune, these three annual events are well spaced fairly evenly throughout the year. And funnily enough, we’ve been celebrating by dining at one of Sydney’s finest, three times per year, for as long as we can remember. Something like ten to fifteen years. What we like best is how we’re welcomed back each time. Like a long lost family member. We love how we “catch up” with each of the wait staff, and how each one of them “visit’” with us, at each serving of our lunch. When we’ve finished lunch, we schedule our next visit, and it’s made, without question. In fact, we feel like we’ve become so much a part of the family, that when we sometimes bump into staff from here that have moved on, when we occasionally dine elsewhere, we find that remarkably, there’s a bond there that still remains. It’s an amazing feeling, to be valued, as a valued, regular client. It’s this feeling, this feeling of being valued, this feeling of connection, that I try to recreate in my Dental Office with my own valued clients and patients. I want the staff in my Office to be treating the patients as guests, and not just teeth and mouths. In the same way that our favourite restaurant considers my wife and I to be guests, and not just diners. When I dine there, I never look at the bill. Because we’ve always experienced exceptional service and value. How is it at your Dental Practice? Is it about the experience? Or is it simply about the teeth? Is Your Dental Practice Website Designed To Impress Dentists? Or New Patients? This week I stumbled across a Dental Practice Website that was just so wrong on so many levels. It was different from most of the *WRONG* websites I have seen. Most of the bad practice websites I see out there look like they have been put together by a second grader on a DOS platform…with a template from the seventies and photos with very poor resolution. This WRONG website that I viewed this week had been done very professionally. But it had been written by the dentist to impress other dentists. Not to impress prospective patients. Let me tell you about its good points. 1. The Home Page offered a free report. This is an important function of a Dental Website. The website needs to be able to collect data, like name and email addresses of visitors, so that the practice can keep in touch with people who have an interest in the services of the practice, yet may not schedule an appointment. The offer of a Free Report of interest is a great way of capturing that data and is an easy way of making your practice stand out amongst your competitors. And you need to have a point of difference. 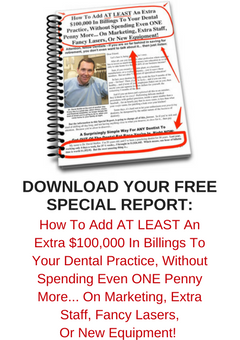 A Free Report on something of interest is a great way to differentiate your practice. 2. The website had a professionally made video, that appeared on the home page. The video’s content was questionable. I’ll mention the content later. The practice website was all about the Doctor. It was hardly focused on attracting patients. One page, the ABOUT page, spoke about the Doctor, and then had nine sub-categories about the practice that began with the word “we” followed by two final categories that spoke about “our”. There was no mention at all about “you”, the patient. And sadly, there was no mention at all about any team members on this page. The section About the Dentist only told me all the societies he was a member of. It did not mention any human-being characteristics. The Frequently Asked Questions Page contained even more Me-Me-itis… the philosophy of the practice, quality of the care team, the gifts and talents of those providing you care? Really these are *Frequently* asked questions? And still no photos or names of the Team members? The video on this website drew my attention because it displayed with a mid stream still image of the dentist standing in a room full of articulators and with an articulator in his hand. Is this doctor the Steve Irwin of articulators? And this video image was right there on the home page! A reel of still images of professionally shot photos of the comforts in the facility interiors would have gone a long way towards appealing to the prospective new patient. So what should a Dental Website really have? For starters, the most visited page on the Dental Office website is the About The Team page. The About The Team tab should be easily found on your Home Page header, right beside the Home tab. And no separate About The Dentist page.. The public wants to know that you are real and your team are real. They want to know what your team do and enjoy in their spare time. They want to see faces, not mug shots. And they want to see group photos of the team in fun and relaxed situations in the office. Not straight-line stuff with the tallest in the middle. You can really impress visitors to your site by having your photos professionally taken with a touch of glamour to them. It really shows the public that you value your team. But most importantly, the public want to know what kind of person you are, and what you like to do. Not how many courses you’ve taken, and how many societies you belong to. Your Home Page should be quick to load and should also be easy to navigate around. Ideally it should have one or two team photos that are of high quality resolution, with people smiling. Save the photos of your building for your mum and your Nan. I had the pleasure of spending a day listening to Howard Farran share just a small part of his Dental Knowledge with a group of Dentists in Sydney last Saturday. Howard is the founder and owner of Dentaltown forum. Here are some of Howard’s pearls. If Dental Insurance doesn’t cover treatment needed then it’s our role to convince the patient that they should be thinking about their health and not about their insurance. So if they need to see the hygienist four times per year to maintain their teeth but the insurance only pays on two visits per year, then we must disregard the rules and encourage the patient to act in the best interests of their health, and their teeth, and not just think of the insurance classifications. Following on from the point above, sometimes we need to say things that may be uncomfortable to us, and to the patient. But are in the best interests of the patient. Get used to looking after the patient. Howard’s take was that the primary role of the person at the front is to schedule treatment and appointments for those calling in and those leaving after appointments. An empty chair makes nobody happy. My take is it is the role of the person at the front to ensure that nothing gets in the way of patients receiving their necessary treatment, when it is needed. Not sometime later, if at all. I agree with Howard here, that a long resume of previous Dental Offices worked at may not reveal the “negative” experiences, both for the offices and for the applicant. It is easier to teach someone with a great attitude the necessary dental skills required to work efficiently in a Dental Office. It is also true that it can be sometimes near impossible to train desired outlook and personality into some people with Dental skills. I’ve always believed that in this day and age people would prefer to talk to a live person rather than speak to a machine and leave a message. So I always had my staff take split lunch shifts, so that there was always a team member available to answer the phone. Howard espoused this, along with employing someone to come in ninety minutes prior to the office opening, just to answer the phone. Similarly, at the end of the day, a team member stayed back for ninety minutes after the office closed, because this was another time when calls were not being answered. It is also important to have somebody answering the phone on days when there is no dentist at the office. Never *NOT* have a live person answering your phone. At my office we used to divert the Dental Office phone to a mobile phone or cell phone that a team member was paid to answer if it rang after hours. Now we have an outside party record and track and follow up all incoming calls and all missed calls 24/7. Email me if you are interested in finding out more. Remember, it’s impossible to treat patients whose calls you fail to answer…. Most dentists are “C” types, and as such, are overly technical. In fact, most Dentists are under-done on the people skills side. So, it makes sense that if your Dental Office stands out head and shoulders above its competitors because it focuses on providing its Customers with a well-structured, systemised World Class Customer Experience, you will always have patients beating a path to your door. If all you are doing is simply providing just dental work, then your customers can get their dental work done at any old place….